Nathan Drake explores the ancient world, journeys to Earth's core, and encourages people to read. November 1 seems like a long way away for Uncharted fans, who have to wait until then for Uncharted 3: Drake's Deception. Sony has a way to help these fans - as well as anyone in need of a good adventure story - cope. Next month, Sony will work in conjunction with Random House to release a novel that recounts more of Nathan Drake's adventures. A comic book miniseries from DC will arrive after the anticipated game sequel. The novel, entitled Uncharted: The Fourth Labyrinth, will see Nathan Drake and Victor Sullivan traveling from the urban jungle of Manhattan to the ancient cities of Greece and Egypt as they search for ever-so-slightly mystical treasure. Christopher Golden, the popular horror author, wrote the book and had fun working with Naughty Dog's popular protagonist. "I had a blast writing UNCHARTED: The Fourth Labyrinth," said Golden. "Mystery, suspense, mythology, pulp action, sinister plots, beautiful women, and treasure - when it comes to the world of Nathan Drake, what's not to love?" 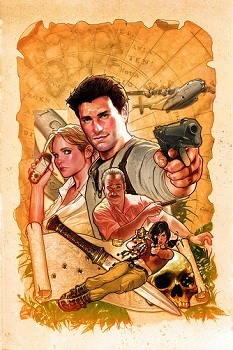 The comic book miniseries will act as a prequel to both Uncharted 3 and Uncharted 2, and will come by way of writer Joshua Williamson and artist Sergio Sandoval. DC has not indicated how many issues the comic will run for, but has given some intriguing plot teasers. The miniseries will take Drake to a lost city in the center of the Earth as he follows in the footsteps of explorer Richard Byrd. The novel will arrive in paperback and eBook format on October 4, while comic book fans will have to wait until November 30 to get their monthly Uncharted fix.